Painting out has started again with a vengeance! I have been trying to finish off my painting out work in the studio and starting to get ill with the smell of my oils. In desperation I tried to go back to acrylics but nearly landed up in tears. I phoned Catherine at Art Source in Observatory and she said that they had just received small starter packs of water soluble oils from Reeves and that I really should try it out as they were only R65. 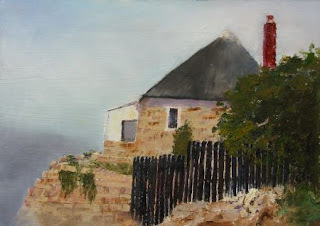 Well, this morning I tackled a photo of Baillie's cottage that I took on the first Monday paint out. Oh what a pleasure to be able to fiddle and fuss and create. I love them! I must say that I did miss using a medium and I must get some of that. It is water soluble as well with no harmful solvents! What do you think?????? Just as I remember it. You did it justice. I used to pass this cottage by train daily going from Muizenberg to Fish Hoek High school. I think water soluble oils look as good as other oils. Well done. Thank you so much Jean. The cottage seems to be empty now with a sign outside 'available to hire for functions'. It must be worth an absolute fortune now! Hi Barbara, A photograph is not what I wanted!!! I have changed it a bit after doing an online workshop with Johannes Vloothuis (Canadian Artist). I think it now looks a bit better? !